It’s a game changer. In the next few years, there’ll be year-round access to our polar real estate. Last Friday the Minister for the Environment and Energy Josh Frydenberg and Foreign Minister Julie Bishop announced that we’re going to build the first paved runway in Antarctica at Davis station, our southernmost Antarctic research station. Davis is currently accessible only during the Austral summer by icebreaker or by internal flights using small aircraft. 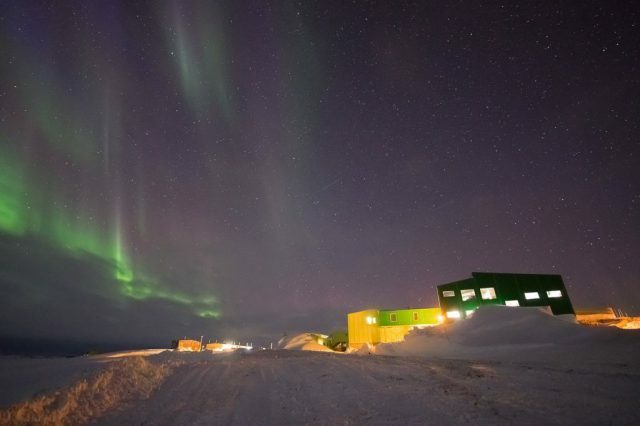 It’s much closer to Australia’s principal area of scientific work than is Casey Station. Our Antarctic ice runway at Wilkins Aerodrome, which was opened 10 years ago near Casey Station, is accessible only in summer. The new runway will be 1,400 kilometres from Australia’s first intercontinental ice runway at Wilkins Aerodrome. The runway will be 2,700 metres, the length required by long-range airliners like Boeing’s 777 and 787, or an A330. The Royal Australian Air Force could also be part of the action. The Australian Antarctic Division started joint operational missions with a C‑17A in 2015—the first time the RAAF had flown missions to the Australian Antarctic Territory since 1963. The C‑17A has since flown 19 missions to Wilkins Aerodrome, transporting large cargo. The RAAF’s C‑17A Globemaster III can reach Davis with refuelling, and this was in fact done last September. The aircraft was refuelled by a KC‑30A Multi Role Tanker Transport during the mission, the first time Australia has conducted air-to-air refuelling over the sub-Antarctic region. The US Air Force also operates C‑17s between Christchurch and Pegasus Field near McMurdo Station. While the Antarctic Treaty prevents the militarisation of Antarctica it doesn’t prevent the use of military aircraft or ships to provide logistics support. 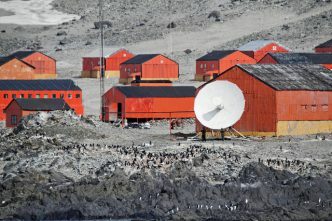 Australia’s new paved airstrip will be in the Vestfold Hills region of East Antarctica, approximately six kilometres from Davis research station. ‘The new runway will provide more reliable access to Antarctica throughout the year, improving our ability to conduct year-round, world-class scientific research and respond to emergencies,’ Josh Frydenberg pointed out. Most importantly the new runway will allow for cooperation with teams from other countries conducting research on the frozen continent. Those include teams from China, Russia and India who have bases nearby and that might also want to use the runway. The Turnbull government says the new runway is to support science rather being designed for tourism. It should be noted that the tourism issue was raised when the Wilkins runway opened in 2008. The Wilkins runway was also intended to support science research, and there hasn’t been a great influx of tourists since it opened. It’s good news for Hobart. 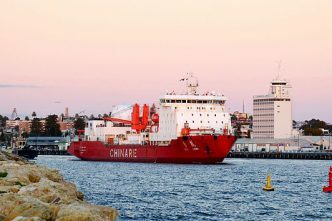 Frydenberg pointed out that the establishment of a permanent link between Hobart and Antarctica ‘will make it a more attractive destination for Antarctic nations to base their operations in Tasmania’. A detailed business case is now being drawn up, including an examination of potential designs for the paved runway. The Antarctic Treaty’s Madrid Protocol on environmental protection designates Antarctica as a ‘natural reserve, devoted to peace and science’ and establishes that ‘protection of the environment shall be a fundamental consideration in the planning and conduct of all activities in the Antarctic’… a paved runway in Antarctica is not only a breach of these fundamental treaty obligations but also a distressing breach of faith with those of us in the Australian community who have supported past governments—of all persuasions—as good and honourable custodians of Antarctica. While the site for the runway has been carefully selected to avoid any sensitive areas, Minister Frydenberg has promised a rigorous environmental assessment of the project to meet federal environmental laws, such as the Antarctic Treaty (Environment Protection) Act 1980 and the Environment Protection and Biodiversity Conservation Act 1999, as well as the requirements of the Madrid Protocol to the Antarctic Treaty. There was a two year investigation into the best site. The announcement last week is in line with the 2014 Press Review on our strategic interests in Antarctica and the Australian government’s Australian Antarctic Strategy and 20 Year Action Plan, released in April 2016, to lift our presence down south. 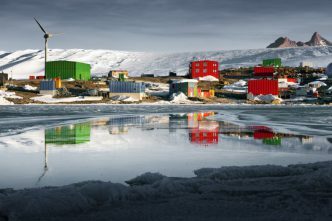 The action plan has already seen new commitments such as rebuilding the research station on sub-Antarctic Macquarie Island and the commissioning of a new icebreaker ship, RSV Nuyina. New Antarctic science funding was announced in the recent budget. It’s also worth noting that the claim that’s sometimes made that China now has a greater presence and greater capacity than us in the east Antarctic sector of our Antarctic territory is looking even more misleading. Our Antarctic program is larger than China’s, whether we look at people on the ground, logistics, scientific infrastructure, programmed scientific research, or seasonal and year-round presence. The Davis runway is still a few years away, and it won’t be a panacea to all the challenges of Antarctic logistics. But the announcement of the first paved runway in Antarctica increases Australia’s polar capability and supports the long-term objective of ensuring that we’re the partner of choice in east Antarctica. Anthony Bergin is a senior analyst at ASPI and a senior research fellow at the ANU’s National Security College. Image courtesy Department of the Environment and Energy Australia Antarctic Division.